Your Choice---Home Study - or - come in person. *Home Study: Tuning Fork Therapy® Practitioner certifications are available for Home Study/Distant Learning. All eight levels of training is also vailable for on-site learning. Home Study options cost $299.00 and include tuning forks, book, hand outs, three instructional dvd's, and certificate. ***Students receive 8 FL Massage CEU's and 8 NCBTMB CE's for successful completion of the Home Study course. *In Person: On-site individual courses cost $399.00 and include forks, book, hand outs, and certificate. On-site classes earn 8 FL Massage CEU's and 8 NCBTMB CE's. This qualifies as a LIVE massage class with focus on massage therapy. *Become a certified and registered Tuning Fork Therapy® Practitioner by taking your courses through this website. Each successful completion of a level entitles you to teach, certify and register others in that level. Certified and registered students will also be able to receive discounts on books and tuning forks for themselves and their students. Instructors and practitioners will also be listed for free on the Tuning Fork Therapy® Practitioner database. Sorry, but you must begin your journey with the first step-Level One. "All around us are forces of energy. The air we breathe, the water we drink, and the foods we eat are all forces of energy. So, too, are the sounds we hear. A bird sings, a frog croaks, a bell rings, all these sounds and more elicit a specific response in our minds. Whether we are aware of it or not we are subconsciously taking note and filing away information about the world around us. In our daily lives, we are inundated with a variety of sounds. For the most part, we have trained ourselves to filter out the noise of day to day living in a modern society. A case in point, how many passing cars do you now single out and count in a day? For the most part you have only made yourself away that there are passing cars and never give them another notice unless something unexpected happens, such as a crash. Have you ever noticed how your attention turns to the sound of an automobile crash? For those of you who are parents, even the sound a child calling for its mother can grab your attention. This is the world we live in, the world of sound communication. What I find fascinating is how sound can travel to the brain when one is deaf. This is very interesting and to date there has not been much study on the use of tuning forks on a deaf person. In Tuning Fork healing, the vibrations of the tuning fork can be just as effective as the sound one hears during the session. In this way, even deaf people can "feel" the sensations and vibrations in their bodies. Tuning Forks are labeled according to their HZ (cycles per second). A Middle C" tuning fork will be labeled at 512 HZ (512 cycles per second). The Middle "C" tuning fork is associated with the Root Chakra and can help people who suffer from feet, knee and leg problems. The Middle "C" tuning fork also deals with such emotions as: anger, impulsiveness, insecurity, fear and lack of trust. Each of the tuning forks that are found in a basic 8 piece set correlates to its own chakra, color and vibration. Tuning forks can be used as a meditative practice, balancing each of the chakra and harmonizing the aura. Tuning forks can be used to enhance the nutrition of food and water and be used to remove negative and stagnant energy in a room. Vibrating Tuning Forks can used in place of needles on the reflex points and acupuncture points of the body. While humans benefit from sound therapy, pets and plants can still reap benefits from a tuning fork session." To order OUTSIDE OF U.S.
Students successfully completing this level will be able to teach their own Level Onee Tuning Fork Therapy® Practitioner classes and certify their own students to this level. 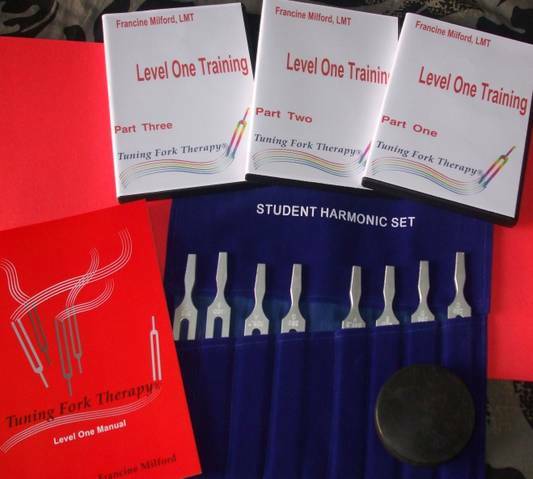 ***ALL Level One Tuning Fork Therapy® Practitioenr certifcations are on a one-on-one basis. Order your workshop on-site attendance below for $399. 20-Hour Fl. and National Ceu's in a Two-Day Workshop. Combine the Tuning Fork Therapy® home study certification with the Tuning Fork Massage class for only $399. Bring a friend and they pay of the cost when attending the workshop with you. "So AWESOME! I totally enjoyed the course, I learned ALOT and feel very confident making blends for my friends and clients. Be Blessed! 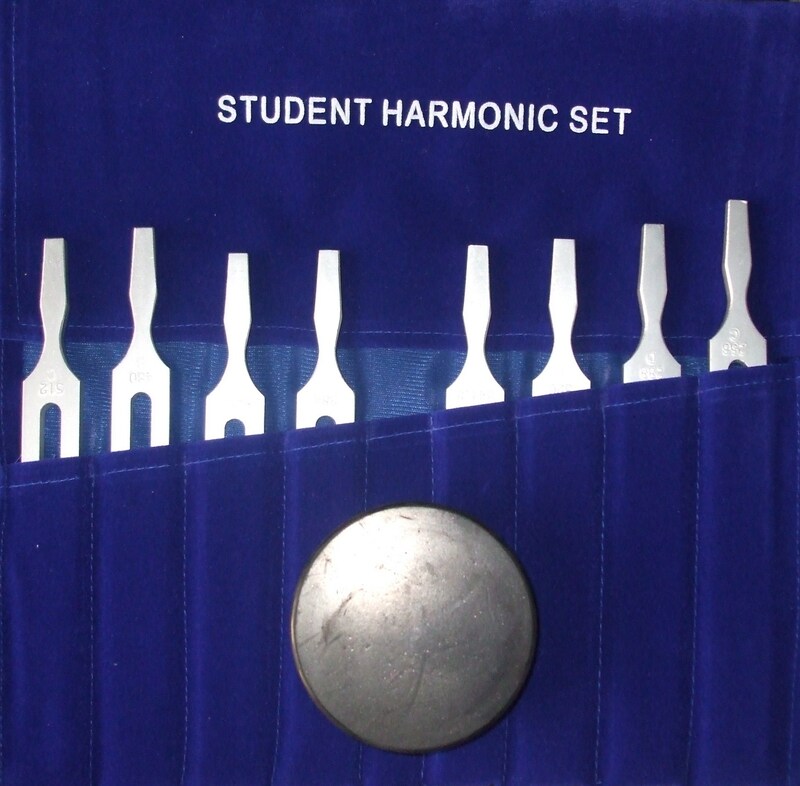 xoxo U"
Harmonic Student Set of tuning forks and round black hockey puck. Student Kits are offered for purchase to Registered Practitioners ONLY. 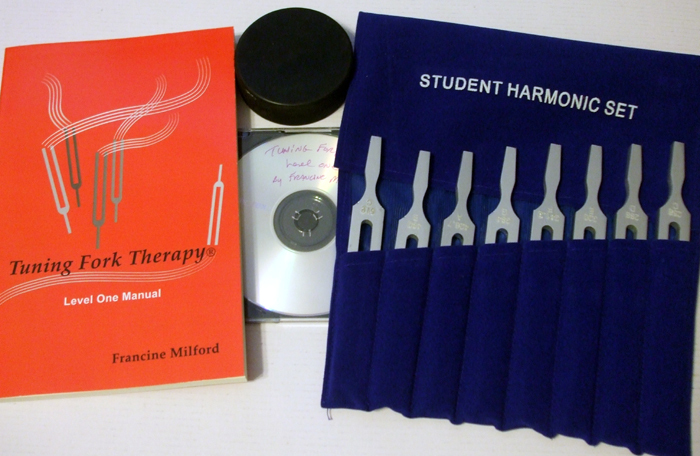 Each kit contains the Tuning Fork Therapy® Book, Student Harmonic 8-piece tuning fork set, black round activator, and a certificate with unique student registration number. When you are ready to teach your own courses, just drop me an email, along with your registration number, at TFtherapy@cs.com and I will send you an invoice to purchase your student kits.